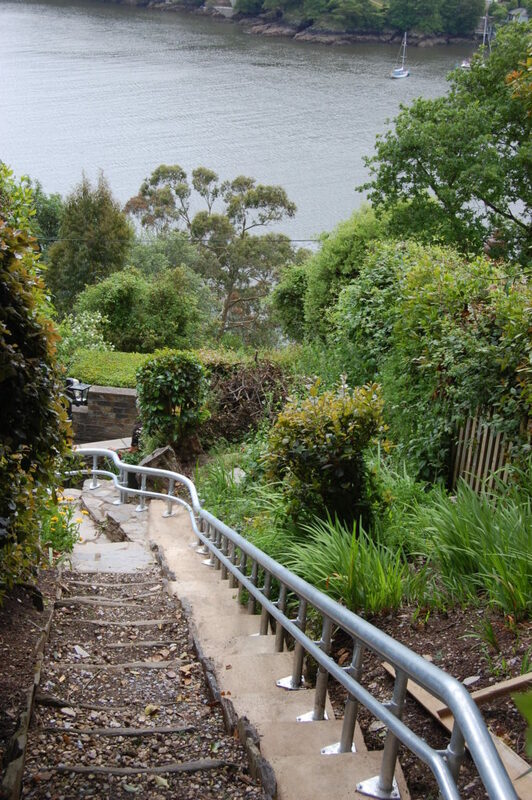 In January 2017 we were approached by a private client in Kingswear, Devon who was looking to future-proof their home and provide disabled access not only to themselves but to friends as well. 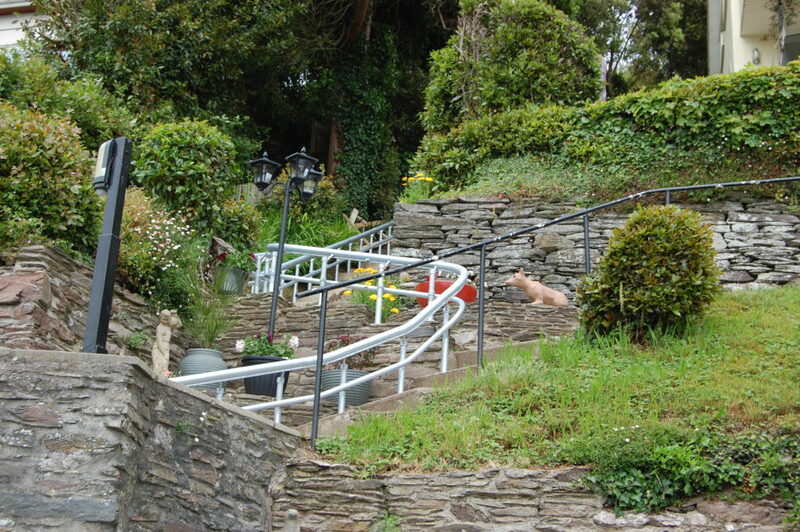 Similar to many properties across the Devon coastline, this home was situated on the side of a hill with car parking several metres below the entrance to the house. 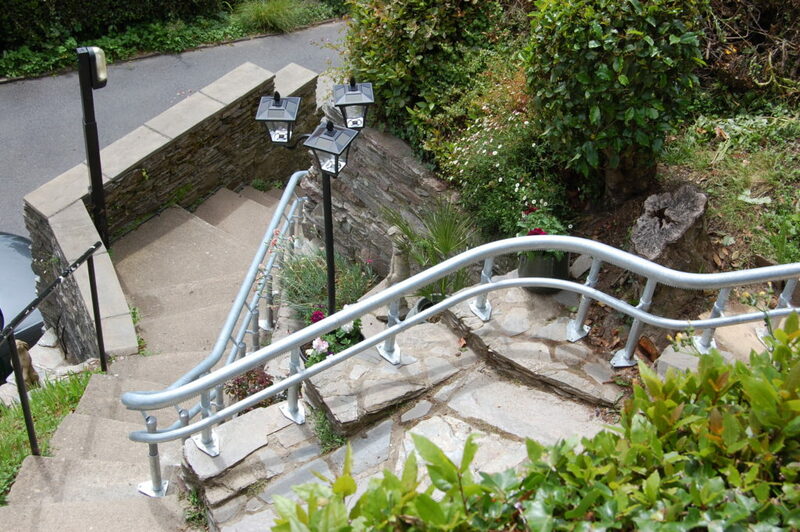 After discussion with the client we decided that the best option would be to install an outdoor stairlift. 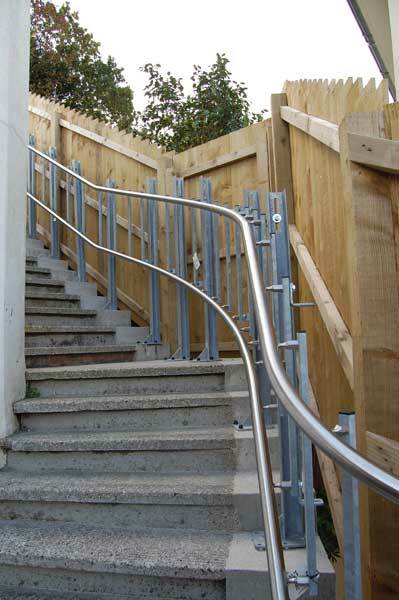 Other options such as a platform lift would require too much builders work and wouldn't be an affordable option while there was too little space to fit an inclined platform lift without expanding the width of the steps. 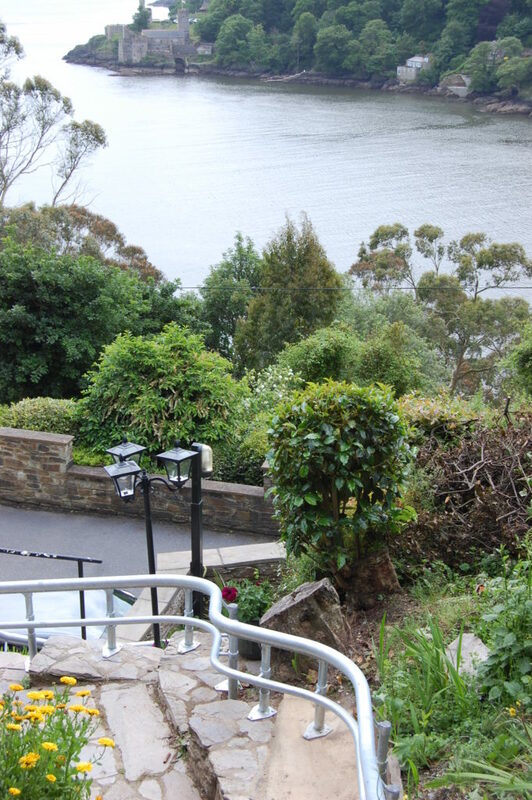 The total travel of the outdoor stairlift is over 23 metres spread across 43 steps from the road below to the front door. Even though the route the lift travels is a complicated one with many twists and turns, the outdoor stairlift was installed in one day. Due to the lift's location and proximity to the sea, all metal components were made out of marine-grade stainless steel to prevent any rust or corrosion forming in the future. 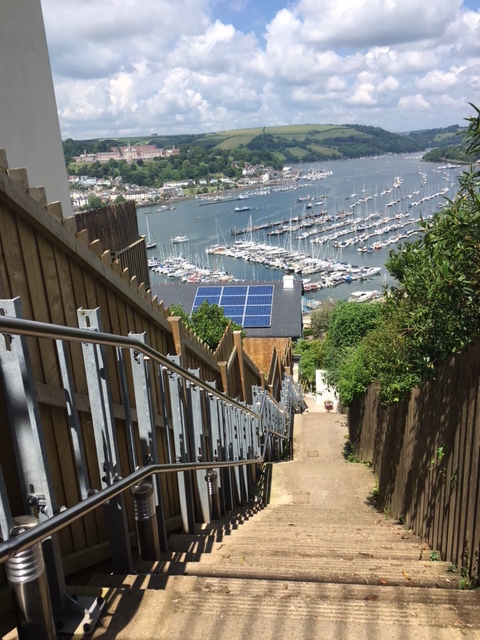 The client was very happy with the installation and has a beautiful view of the River Dart when they use the outdoor stairlift. 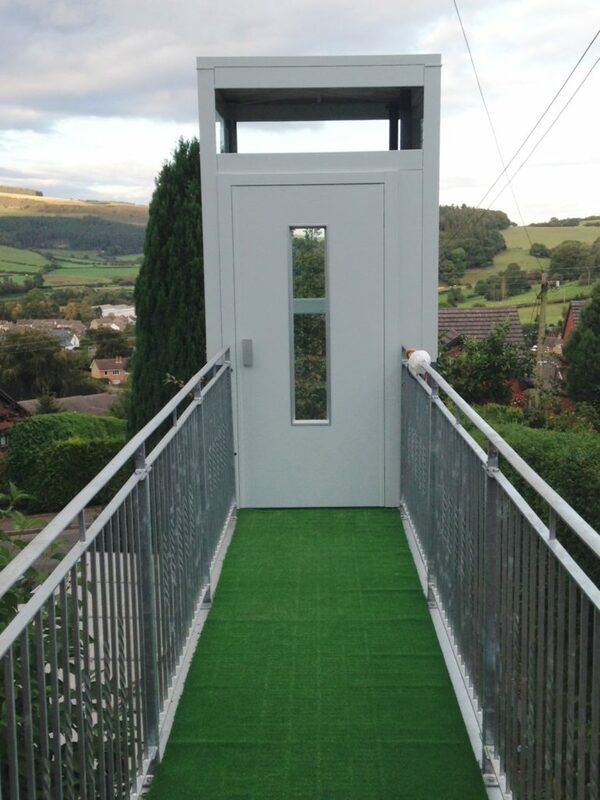 To see more examples of our outdoor lifts and garden lifts click on the following projects: Outdoor Home Lift in Powys, Inclined Platform Lift in Dartmouth, Inclined Platform Lift in Parkstone. We were approached by a private client in St John's Wood, Central London, who wanted a glass home lift running across 5 floors of his house. St John's Wood is a largely residential area of London, adjacent to Regent's Park and home of Lord's cricket ground. It is an extremely affluent district of London with large detached properties contrary to London's usual townhouse homes. With this in mind the client wanted a lift that would live up to his expectations and seamlessly blend into the aesthetics of his home. After attending the site to measure the lift shaft we submitted the drawings and discussed with the client his vision and exactly what he wanted in regards to style and finishes. 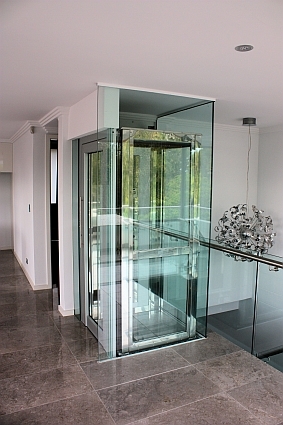 He made it clear that he wanted the lift to look very modern and be completed in a full glass structure with glass doors. We fitted an EP Elfo with cabin dimensions of 950mm x 1000mm which travelled a total distance of 10.5 metres across 5 floors. 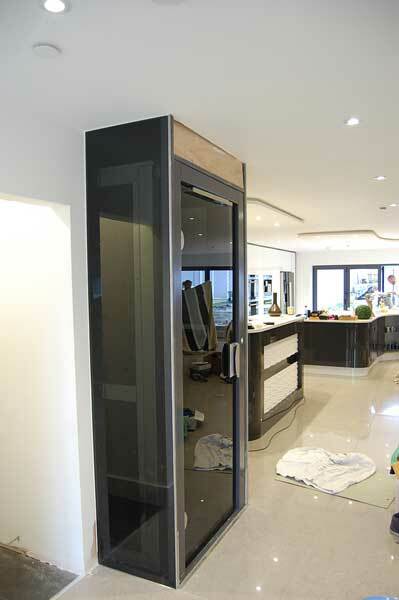 The lift was finished with panoramic glass doors that were 800mm wide creating a spacious cabin interior. The glass finish for both the structure and doors meant that the lift matched the client's modern and luxurious specifications. 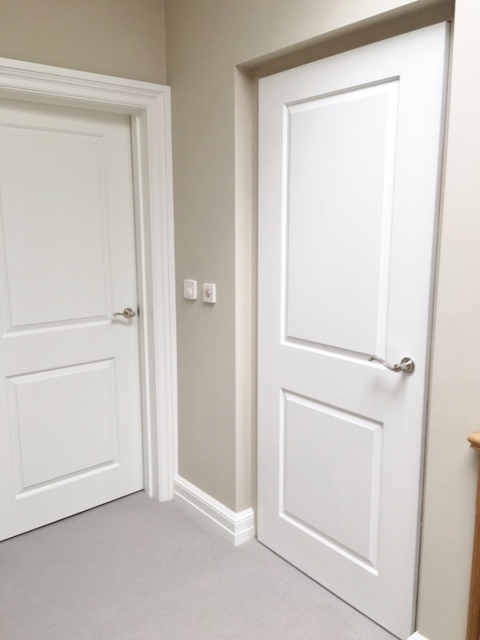 To see more of home and residential lift projects have a look at our Whitecliff, Westbourne, Branksome Park, Torquay, Weymouth and Powys projects. We were approached by a group of clients that wanted to find a way to get from the road to their house some 44 metres up a steep incline. An inclined platform lift would be an easy way to get to their homes as well as transport shopping and other heavy items to and from the houses. 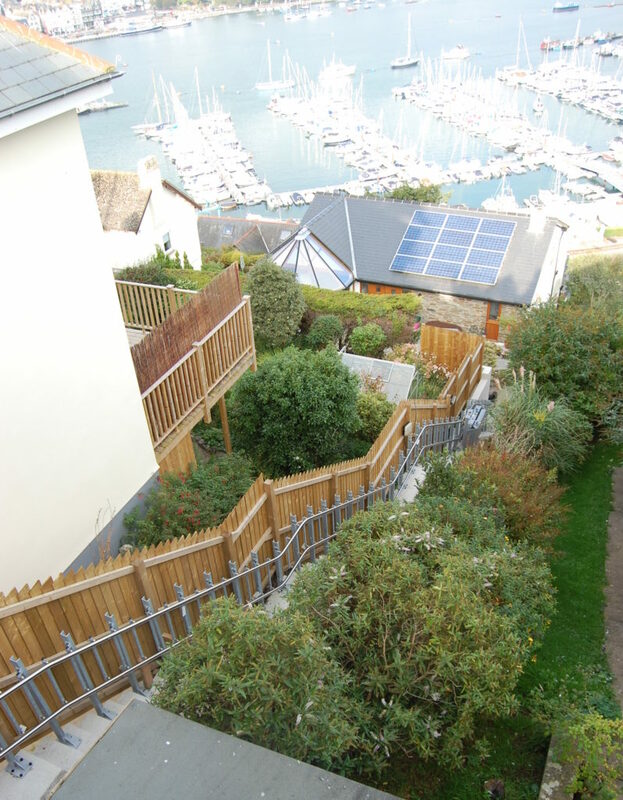 The lift would provide access for 3 homes that shared the same access route up the side of a hill in Dartmouth, Devon. The only viable option for this particular challenge was to install an inclined platform lift however we had never installed anything this long before. Before we started we needed to photograph every step (all 87!) so we could produce a quality drawing for both the clients and the manufacturer. Due to the location’s proximity to the sea, both the lift and the complex supporting structure would have to be made out of the right materials to prevent any rusting or corrosion. We chose to install a Hiro inclined platform lift, with the lift and the structure built using marine-grade stainless steel so that the system wouldn’t rust or weaken overtime. The lift was installed within 1 week and the clients are very happy. We were approached by a private client in Weymouth who had converted a seaside house into large modern residential apartments spread across 3 floors. Seadown is in the Preston area of Weymouth and only a short walk to Overcombe beach. Many newly built or renovated properties by the sea such as this one have cutting edge designs and have to be built to very high specifications so that they can be easily sold. With this in mind many developers and building contractors are looking to future proof these types of homes as potential buyers expect these expensive properties to have a lift. Whether it is luxury apartments or a fully detached house, a small platform lift can add value to a home. It can be the difference between a property that gets snapped up straightaway and one that stays on the market for months. 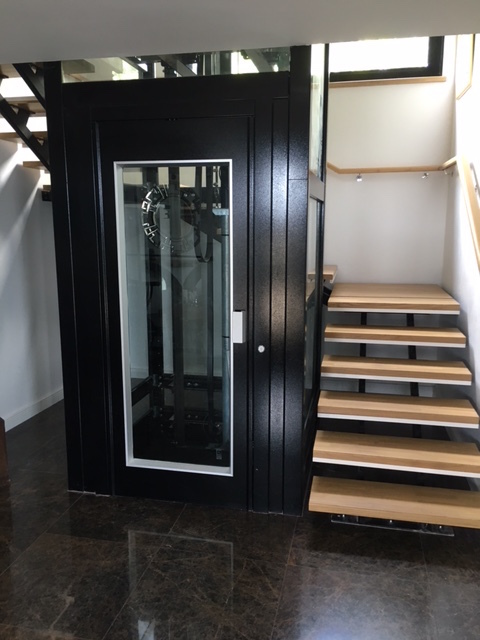 Our client had built his new property, Seadown, in this exact frame of mind and asked us to measure and design a lift for him as he had already built a lift shaft. 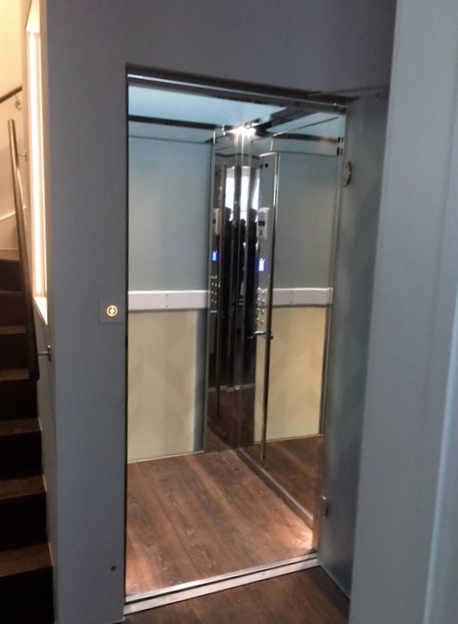 For smaller properties that have half a dozen or so flats a conventional passenger lift can take up too much room which takes away valuable space in the flats. Our smaller platform lifts need less space both above and below the lift as well as having less moving parts so lower maintenance costs. After measuring the lift shaft and submitting a drawing to the client we got the go ahead to order and then install the lift in the flats. We fitted an EP Elfo which has a total travel distance of 6000mm across the 3 floors with an internal cabin of 1280mm x 1000mm. 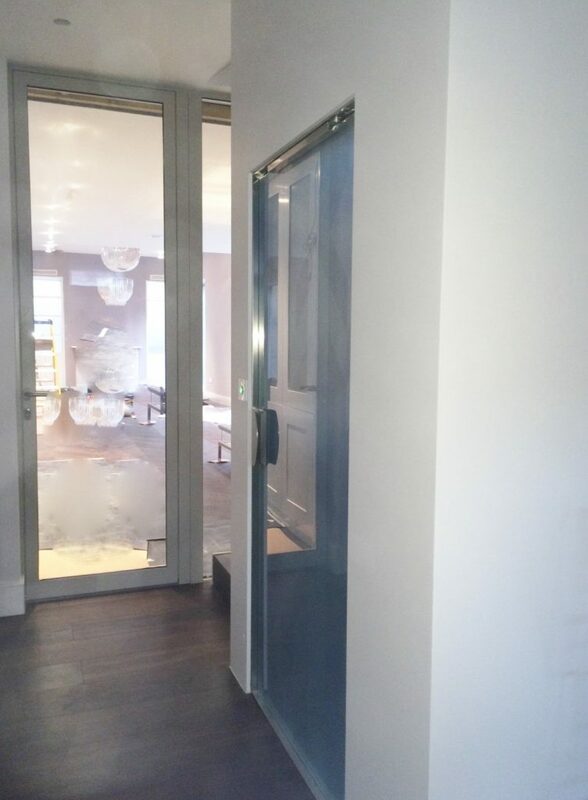 The lift was fitted with 5 automatic self closing doors across the 3 floors - the 800mm-wide doors were finished with smoked glass to match the modern decor of the property. The lift was fitted in under 2 weeks and now makes sure that the flats are accessible for all residents. It also makes it easier for residents to transport heavy goods to their flats and even shopping. To see more of home and residential lift projects have a look at our Whitecliff, Westbourne, Branksome Park, Torquay and Powys projects. 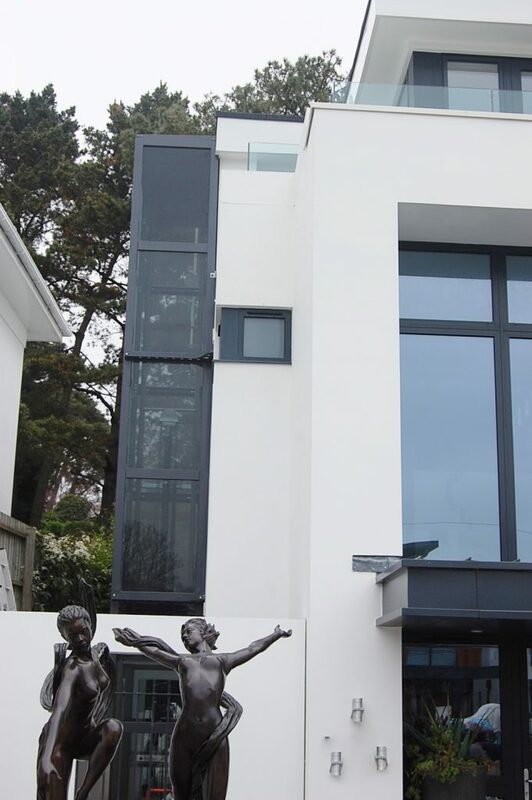 We were approached by a private client in the Branksome Park area of Poole who wanted to install a home lift with an external structure attached to the side of his house. The lift would help both him and his wife travelling floor to floor but would also future proof his home. He wanted a modern style to match the newly built house with glass being a prominent feature of his overall idea. We measured and designed a lift and external structure that would be adjacent to the house with 3 points of entry all on the same side of the lift shaft. We fitted an EP Elfo with cabin dimensions of 1100mm x 830mm which travelled a distance of over 6 metres across 3 floors in its own lift shaft. The steel structure was painted dark grey and was then finished with smoked glass on the 3 external sides. 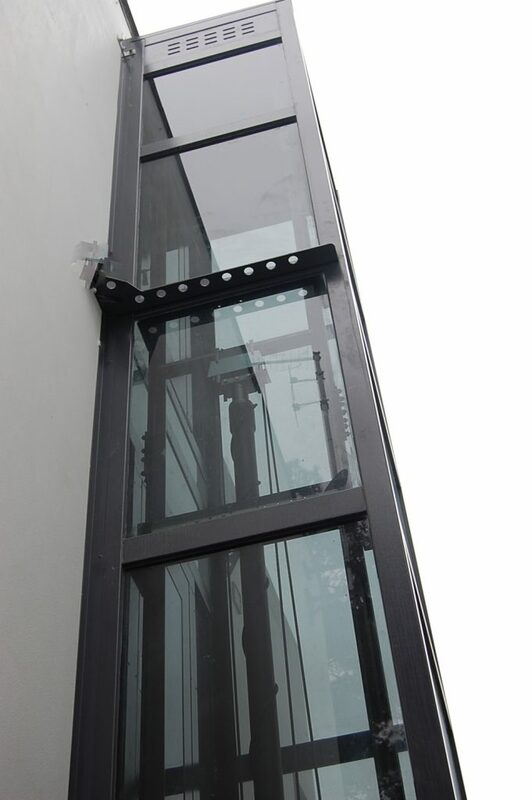 The presence of a majority glass lift structure matched the modern aesthetics of the building and the addition of the smoked effect lends itself to privacy when using the lift. 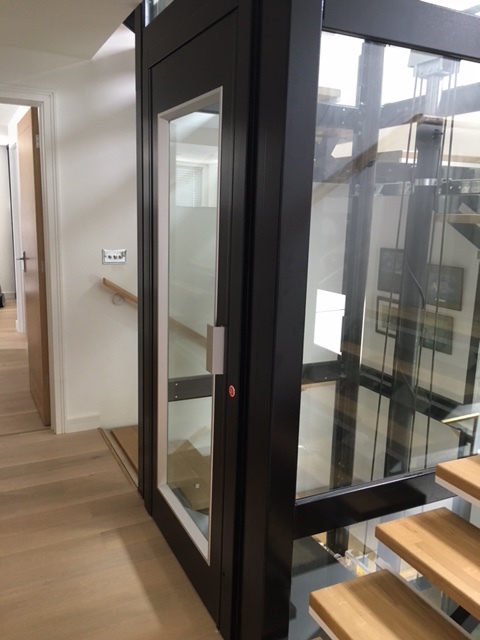 The lift was fitted with 3 triple glazed swing landing doors so that both the house and the lift shaft remained warm with no draughts or loss of heat. 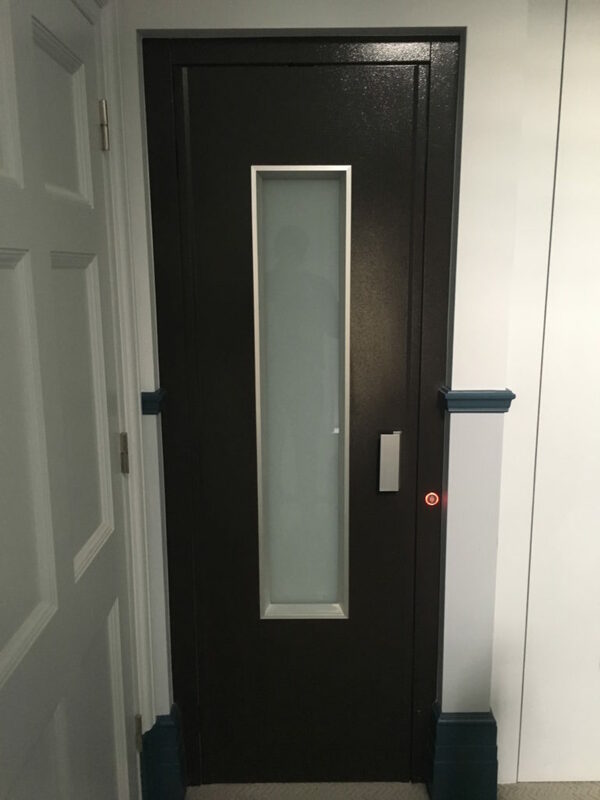 To ensure that the lift was warm and comfortable to use even in the winter months or at night we fitted a small heater so that the lift shaft would be a pleasant temperature. To see more of our home lift projects have a look at our Whitecliff, Westbourne, Torquay, Powys and Newbury projects. We were approached by a client who wanted a home lift installed in their timber framed house in Torquay. The client wanted a lift that would sit in the middle of their wooden staircase and would future-proof his house. The client had designed their house in an Art Deco style and so wanted a lift that wouldn't look out of place with this distinctive appearance and would actually add to its design. We installed an EP Elfo within its own fully glazed structure, the lift total travel was 5.8 metres across 3 floors with a platform size of 1235mm x 1235mm. The client chose a gloss black finish for the structure and automatic swing glass doors to match the house's aesthetics. The flooring of the lift was laid with the same stone tiles as the rest of the house's ground floor so there was seamless transition from landing to lift. 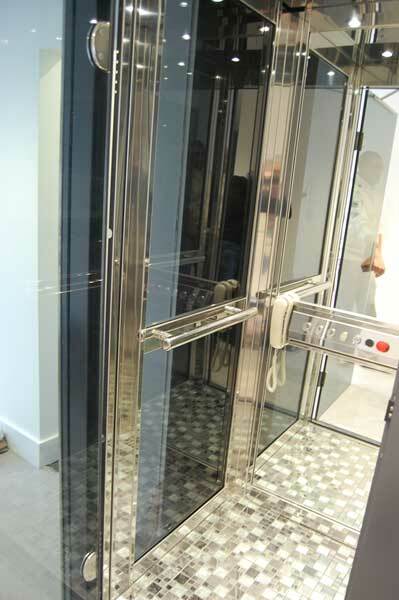 The lift was fitted and installed within a fortnight. To see more of our home lift projects have a look at our Whitecliff, Westbourne, Branksome Park, Newbury and Powys projects. 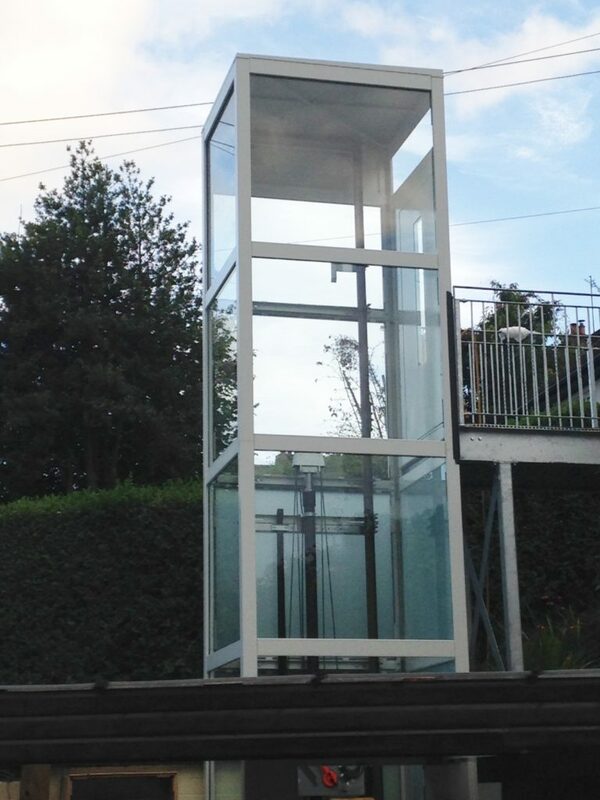 We were approached by a private client as they needed a home lift in their newly built house in Westbourne. 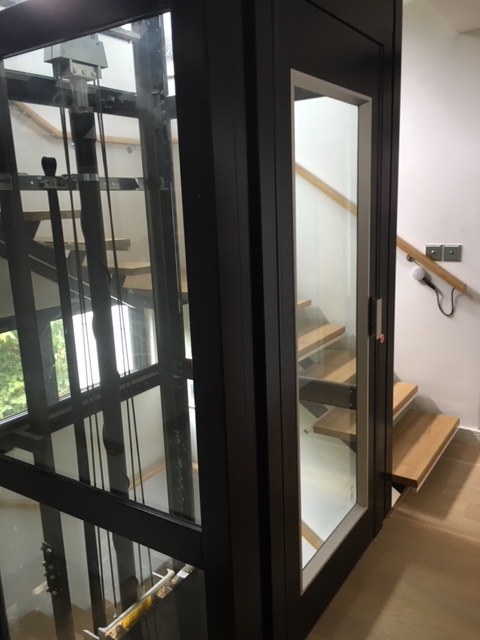 The client needed a small home lift that would fit in the middle of their tight staircase and provide the main access route to the whole of the house. The lift would need to the suit the modern look of their house and specifically the kitchen as this is where the lift would be accessed on the ground floor. We designed and fitted an EP Elfo with platform dimensions of 980mm x 1200mm that would fit within the ready made lift shaft in the stairwell. The lift travel distance was over 5.7 metres across 3 floor levels. 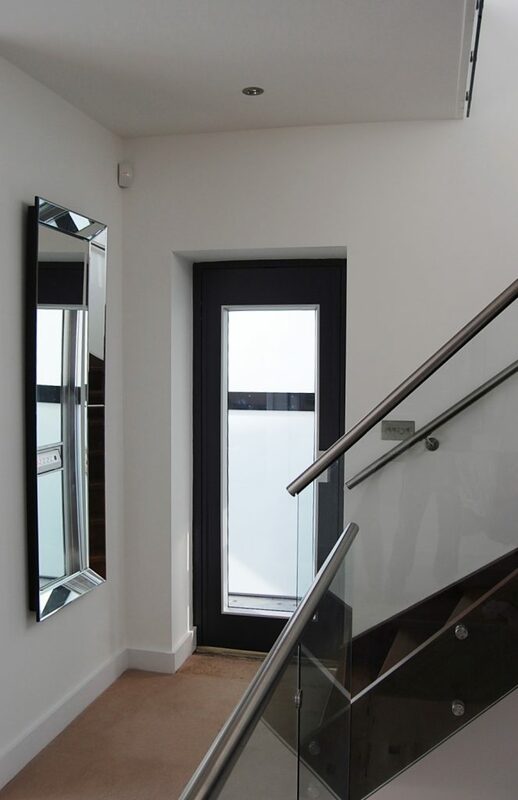 The lift was finished with automatic swing doors - the door on the ground floor was finished in panoramic glass, this means that the whole face of the door is glass with the exception of the door handle, the doors on 1st and 2nd floors were a mixture of steel and glass with the steel being painted black to match the modern style of the home. 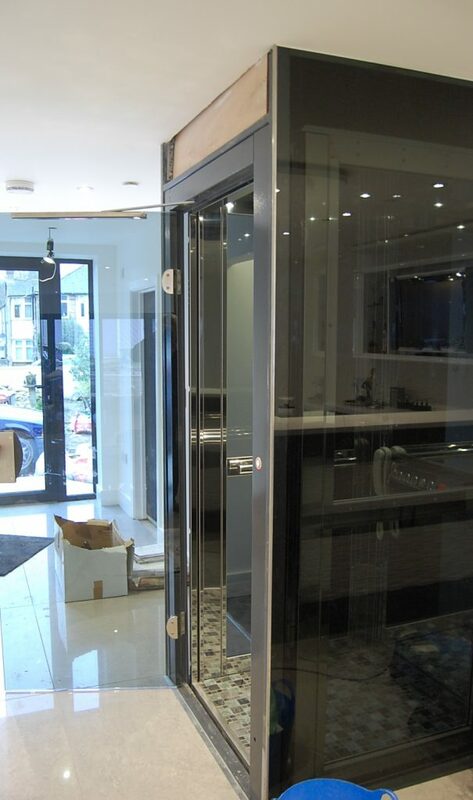 The home lift installation was completed within 7 days and ready in time for the completion of the client's kitchen. To see more of our home lifts projects have a look at our Whitecliff, Branksome Park, Torquay, Powys and Newbury projects. We were asked by the building contractor Calco to come and measure for a cupboard lift for their client in Newbury. 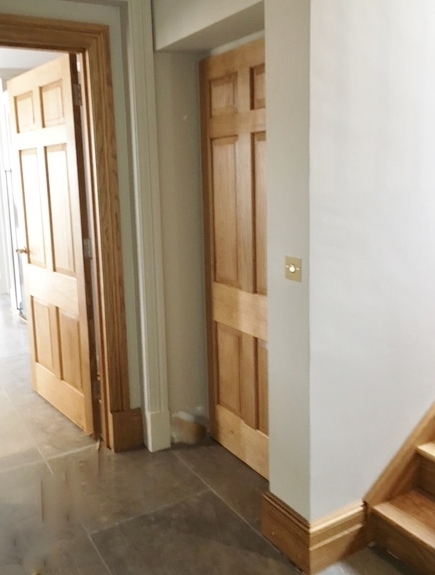 The site was a newly built farmhouse and we were told that the client wanted a lift that would be easily disguised and concealed within their home. The main challenge was that the lift shaft was relatively narrow and so limited options were available. 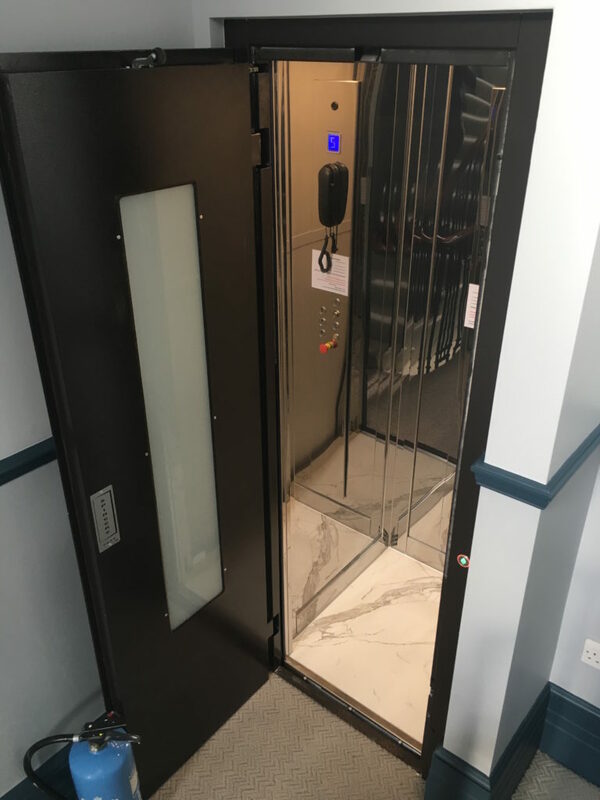 We decided to install the Elfo by EP, due to its versatility and ability to be designed for even the smallest of spaces, the lift shaft measured 1150mm x 1500mm. 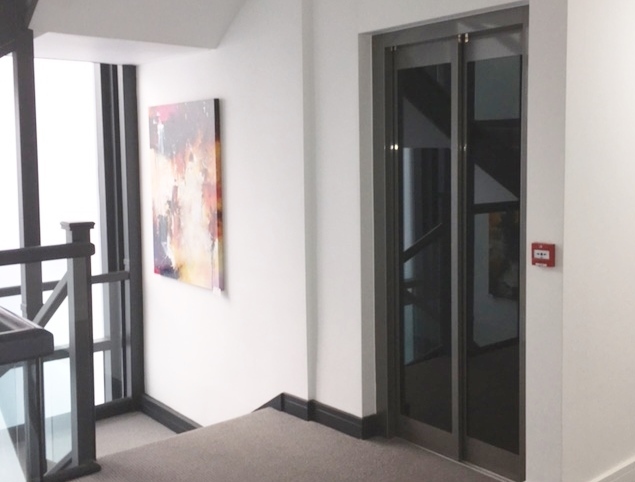 The lift travelled 6m in total across 3 floors with 800mm swing doors fitted on each floor. 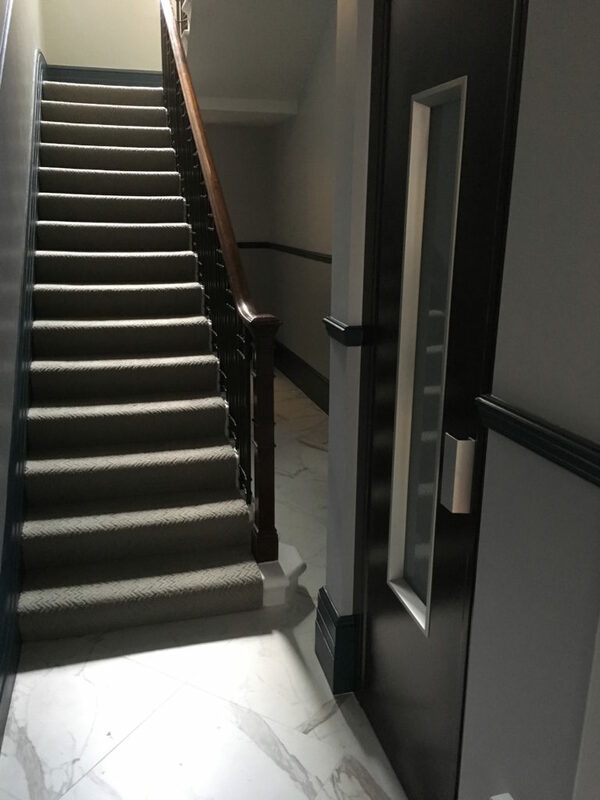 On both the ground floor and 1st floor, the doors matched the others on the floor and so the lift looked as if it was simply another room or cupboard. 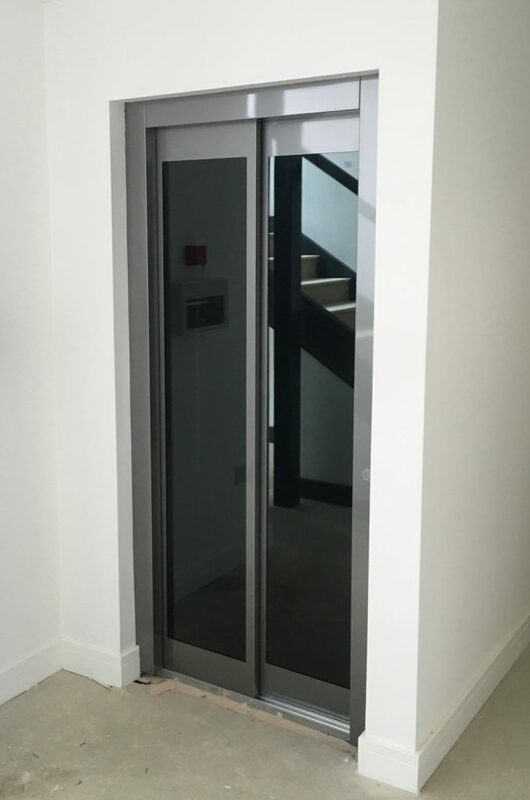 We completed the installation within 8 days and the lift was ready for the client to move into their new home. To see more of our home lift projects have a look at our Westbourne, Powys, Torquay, Branksome Park and Whitecliff projects. We were asked to go to Powys, to measure up for an external home lift in the region for a couple who wanted to make access to their home easier. After speaking with the client we found that 7 other lift companies had turned down the project as it was either too far away for them to realistically complete the project or they simply didn’t have the expertise to design and fit an external home lift. 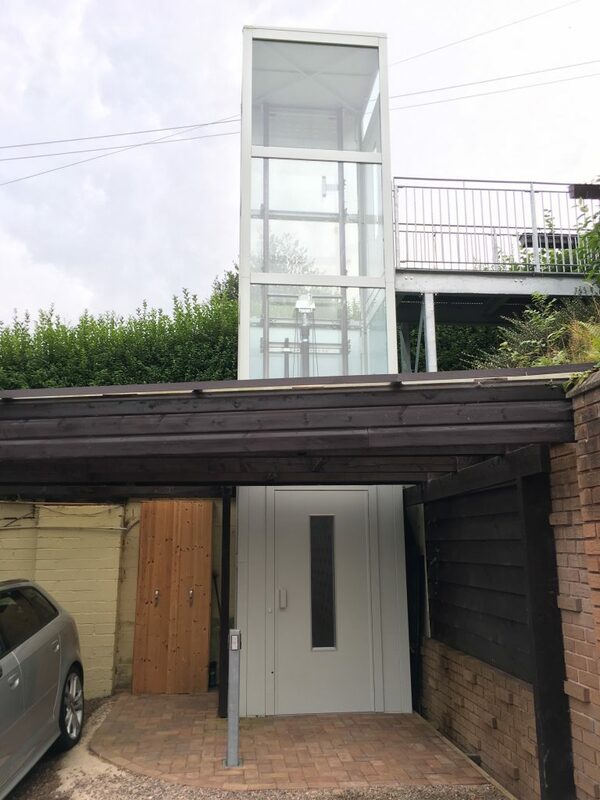 We managed to come up with the solution of an external platform lift within its own fully glazed structure so that the homeowner could see the wonderful vista of the Welsh countryside surrounding their home whilst travelling in the lift. The lift connected the garage with the walkway above which in turn connected straight to their front door. The lift would make it easier to go from the garage straight to the house without having to tackle the steep steps up to the front door and is also useful to take heavy shopping and other items up to the house. The lift that was fitted was a 1600mm x 1500m Elfo EP with a 4.1m travel up to the first floor. The structure was fitted with opaque glass on the ground floor to increase privacy from the road whilst the upper part of the shaft was completely transparent so the homeowner could see the surrounding views. The finish of the lift was in light grey as to match the colour of sky and so the lift would blend in. We installed the lift within a fortnight and the client is very happy with the lift.